If you've been reading my website you know that a healthy potato salad is made with red potatoes with the skins left on. It's low glycemic because it has resistant starch. Normally potatoes have a high glycemic index but when they are chilled as in a salad it changes the chemistry of the starch and gives it a slower glycemic response. We're used to thinking of potato salad as just too high in carbohydrates to be enjoyed if we're really going to manage our weight. What most people don't realize is the main problem for fat storage is our blood sugar. It's true that you should only eat one serving of a carbohydrate dense food at a meal but if it is highly nutritious and doesn't spike your insulin you do not have to give these foods up. That's why resistant starch is such a useful thing to know about. Resistant starch occurs when some complex carbohydrates like rice and potatoes are cooked and then chilled. It is starch that "resists" digestion enough to make it slow burning so it keeps your blood sugar level. Your appetite suppressing hormone rises and you stay fuller longer which makes it a great midday meal! Red potatoes are higher in nutrients than other potatoes especially the skins! Potatoes contain vitamins C and B6 and they are a good source of potassium. 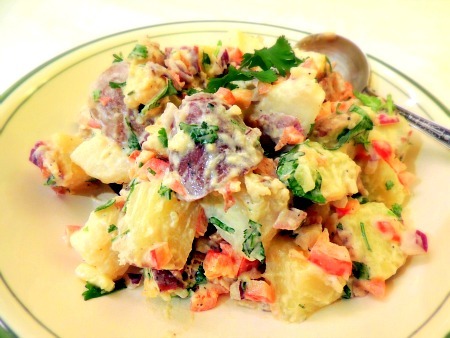 This red potato salad is one of our printable low glycemic index recipes. Put the last 5 ingredients in a jar and shake well. Wash the potatoes well but do not peel. Bring a large pot of water to a boil and cook the potatoes until firm but not too soft - about 10 - 15 minutes depending on the size of the potatoes. Test with a fork. Remove with a slotted spoon to drain on paper towels. Allow them to cool at room temperature before you put on the dressing so it doesn't separate. Cut into quarters or smaller when they are cool enough. Add the rest of the ingredients and the dressing and mix well. This salad will be very satisfying with a dark green leafy salad with cherry tomatoes, sprouts, sliced cucumber, a little feta cheese and light dressing. Resistant starch is different than the starch in most starchy carbohydrates. It does NOT spike your blood sugar. Other starches quickly convert to glucose in your bloodstream and act like pure sugar. When your blood sugar spikes, massive amounts of insulin are produced; so much that the body directs the excess to be stored as fat. So little glucose gets to your muscles for energy that in a couple of hours you're craving more sugars. And of course you're ravenously hungry again. Resistant starch which is in cold rice, cold pasta, cold potatoes, beans and whole grains acts completely differently. It breaks down and digests very slowly and even appears to help you burn fat. Your insulin is regulated properly so that the glucose is used efficiently for energy. You feel sustained energy for several hours. A healthy potato salad is perfect especially if you're watching your weight and there are an endless variety of tastes when you try different herbs and vegetables. Enjoy this cold potato salad for your mid day meal and don't worry about the starch! Return from Healthy Potato Salad to Low Glycemic Recipes. Return from Healthy Potato Salad to Lifetime Fat Loss home page.